CUSTOMIZE YOUR SPECIAL BADGE! GREAT FOR WESTERN WEDDINGS! When it comes to old western apparel and accessories, the badges are one of the more quintessentially western adornments. Gold Mountain Trading offers you the opportunity to get your very own custom badge tailor-made according to your particular preferences! These custom badges are quite the perfect piece for western weddings-so don’t miss out on this amazing opportunity if you've got one coming up! 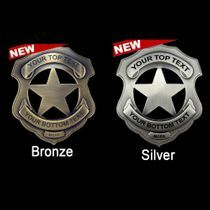 You can get customizable badges in gold and silver round star design, 5-point silver star badge or custom shield design.